As I started similarly with SAP BW 7.3 I try to collect all relevant information sources about in this case SAP HANA here. BTW: What’s HANA? In short it is in-memory solution from SAP. It stands for High-Performance Analytic Appliance and basically it is appliance (plus its software components) that can absorb large volumes of data (e.g. tera bytes) into its “operational” memory. The reason why it is so high performant is that all the data is in memory not stored in hard drives. It can be set up on top of SAP ERP or BW system (plus non SAP databases) without necessity to materialize data via transformations as in contrary to current DWH solutions. HANA bundles several components: in-memory computing engine, real-time replication service, data modeling and data services. As it is delivered as appliance it is depended currently on few vendors are supported: Fujitsu, HP, IBM. phrase: "If you use BW on a SAP HANA database"
What does SAP mean by "In-Memory"? What is the future of Infocubes? SAP HANA Blogseries Part 1: What is SAP HANA and what is the "value" of SAP HANA ? SAP In-memory - what is in the bag? HANA backup script hint... a little bit more security, please! SAP HANA Developer Access Beta program - get the best out of your test-drive! SAP Developer Center @ SDN: access to hosted HANA sandbox systems - currently beta version. Get the project: be lucky enough to get into customer who is running HANA project. Unfortunately there are still only few of them. SAP Mentors: If you are a SAP Mentor then you have an access to SAP HANA Developer Access Beta program. It is an access to cloudshare.com where are virtual machines/images with HANA software (HANA Editor). For first part of Funniest SAP notes ever see here. 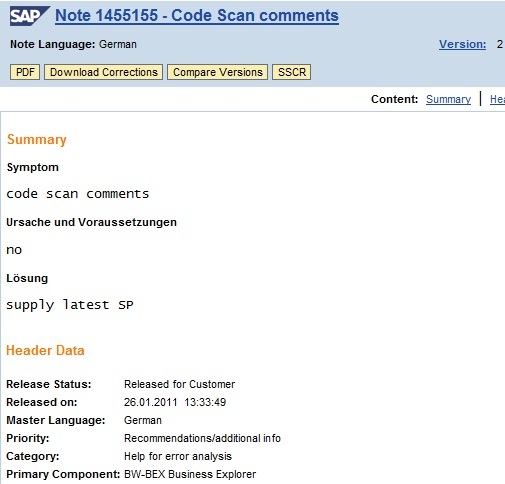 37211 - ftp not via SAProuter : "connection refused"
Furthermore there is a public FTP server ftp://ftp.sap.com of SAP available as well. In contrary to all above mentioned sapservX servers this one server as anonymous access FTP. 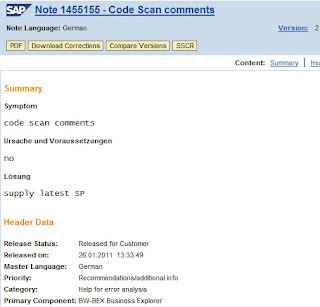 Here you can download some of SAP software that is available for free. Like SAP DB software, etc. Before miniSAP and SAP GUI was located here as well. The only solution how to get out of this situation was to kill saplogon.exe process.